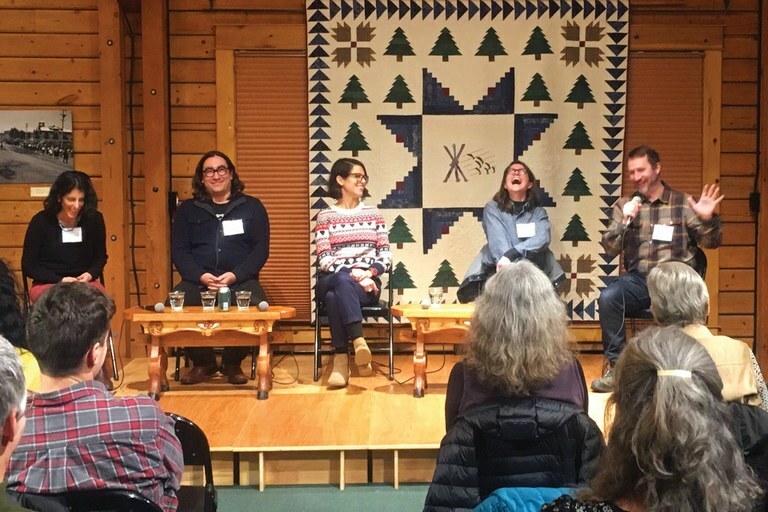 While on a panel with editorial team members, Kate Schimel, center, bursts into the uproarious laughter that we will miss around HCN. With a rare warm week, Gunnison’s ice-paved streets began to melt. In Paonia, though, flowing water — at least the potable kind — is still in short supply. After a major water line break — and the lingering effects of last year’s drought — many residents’ faucets have been shut off for over two weeks. We hope our colleagues will soon have their thirst quenched. It’s been an eventful few weeks for High Country News, including some bittersweet changes. Kate Schimel, our associate editor on the West-North desk and a thought leader on the editorial team, is taking an editor position at Colorado Public Radio. Kate came to HCN as an intern in 2015, already displaying the intellect that carried her up the ranks. She served as digital editor and ushered our collaboration with the Solutions Journalism Network. We’ll miss her deeply, but we’re looking forward to listening to CPR even more than usual. All that means we have openings for an associate editor and assistant editor. See hcn.org/about/jobs for details, and spread the word! In anticipation of Kate’s departure, the West-North desk (including Emily Benson and Carl Segerstrom) got together in Spokane, Washington, for a last hurrah. Emily also gave a guest lecture to an undergraduate feature-writing class at the University of Idaho, where the budding journalists were focused and inquisitive. And Assistant Editor Anna V. Smith spent a week at the Resilience Fellowship Program at CUNY’s Craig Newmark Graduate School of Journalism in New York City, while frequent contributor Ben Goldfarb scored the prestigious E.O. Wilson Prize for Literary Science Writing from PEN America. Ben won for his book Eager: The Surprising, Secret Life of Beavers and Why They Matter, which was excerpted in HCN. Development Director Laurie Milford and Editor-in-Chief Brian Calvert recently visited Miami, Florida, for the 2019 Knight Media Forum. The Knight Foundation and The Aspen Institute issued a report this year, Crisis in Democracy: Renewing Trust in America, and the Miami conference was dedicated to tackling some of journalism’s biggest challenges. HCN was recognized for its work in 2017 and 2018 with the Solutions Journalism Network. In a recent “Heard around the West” (HCN, 3/4/19), astute readers noted that the town of Victor is actually in Montana, not Oregon. Writer Betsy Marston blames the error on the vertigo that has plagued her lately, while the rest of us merely assumed that Tonto, the wandering bison in the story, took the town along with him when he took off roaming. And there’s one more ssss-small correction: In the photo review, “Explore landscapes redefined by human influence” (HCN, 2/18/19), we once left the “s” off the photographer Lucas Foglia’s name. We regret the errors. We’re taking an issue break, so look out for your next magazine in April.